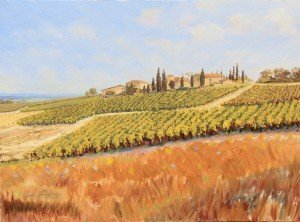 One of The « vin, au Chateau, Gaillac, » series. 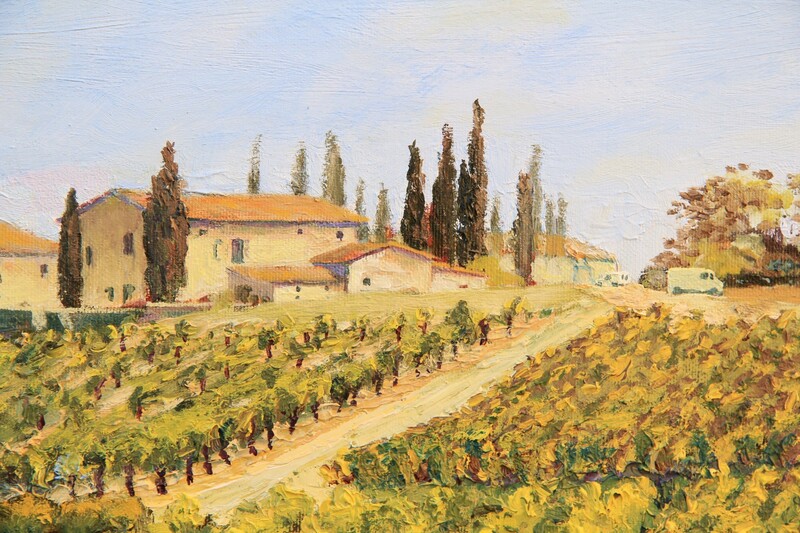 A landscape painting by Gordon Frickers measuring 81 x 5 cms (32” x 23″), oils, available, £4,000. Looking for the best in fine art investments? You have found it here. At Chateau de Lacroix, as is my way I visited several times, spoke with the people, took long walks and an intense look at the place. The buildingas are a lovely complex however what struck me most is how very S W France, very ‘Le Tarn’ it is. That person should slow down and try looking ! 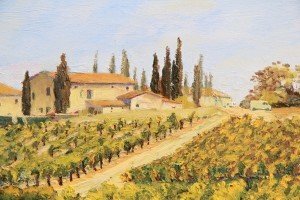 I loved the particularly numerous poplars around chateau de Lacroix and the distant view of the valley of Gaillac with the Black Mountains beyond them which for me mean ‘Mediterranean’ a not very long drive away. 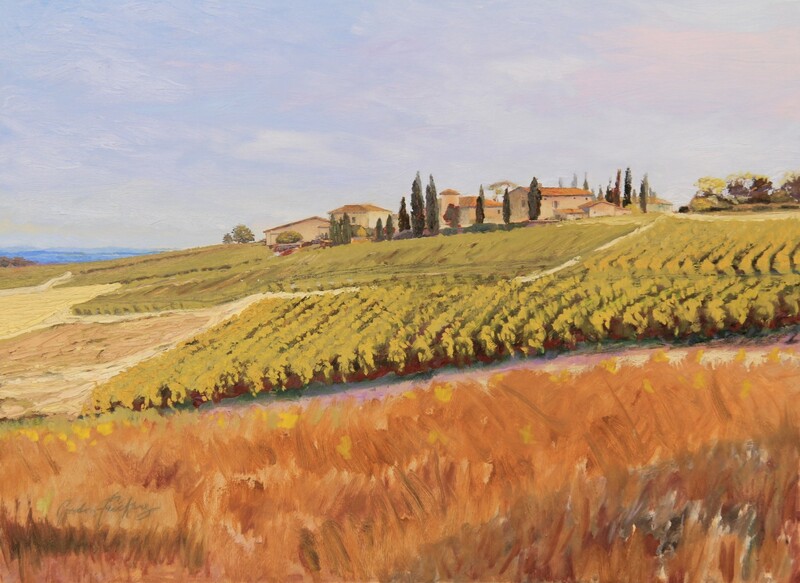 My intention is to see the ‘Vin, au Chateau, Gaillac’ series as a collection, an exhibition of sisters and brothers. This is one of the reasons I have reacted very differently to each painting in this series. 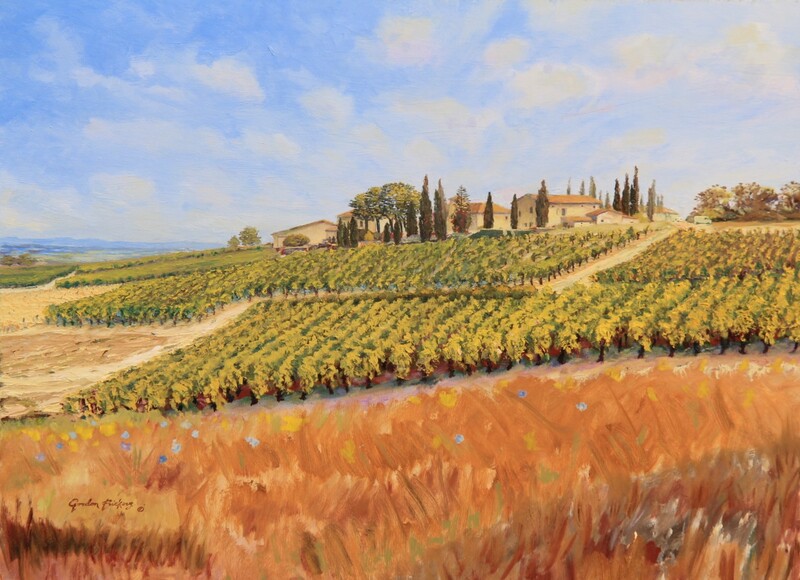 Chateau de Lacoix, one of the Gaillac series, click,see, follow the progress and enjoy. 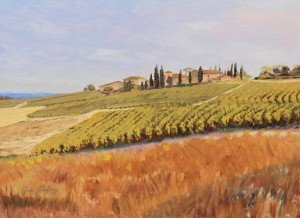 Working up from location visits and studies, I have also used my imagination based on years of observation and numerous experimental studies made in this part of the Tarn province in the heart of l’Occitane. Detail, Chateau de Lacroix, Gaillac, SW France, For fun, the white van of Charles de NOBLET d’ANGLURE a friend of the proprietor, Bruno and of myself, deliberately included. I like to include friends when ever I can. 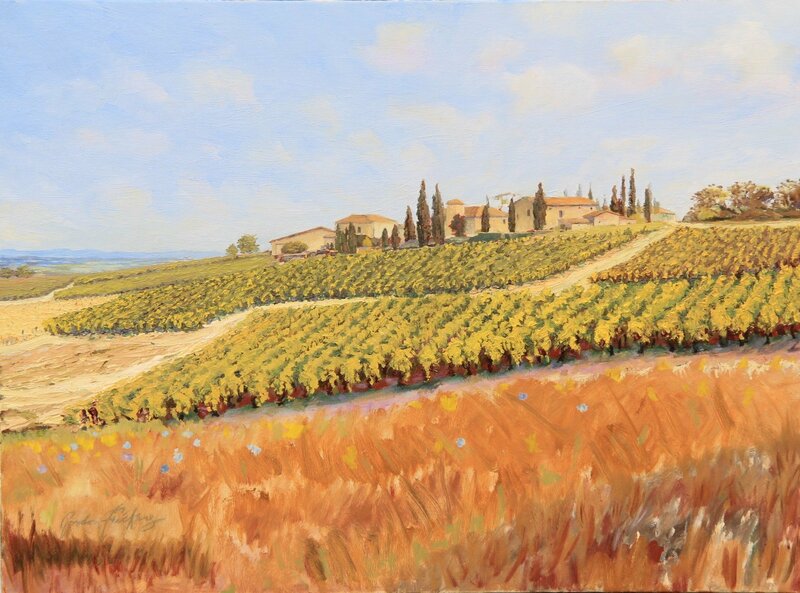 I have chosen to keep the foreground loose, abstracted in order to focus our attention on the light, colours, textures of the vines and on the buildings and trees on this very South of France skyline.